Please try to use this thread as an analysis/learning tool. $40 each?? And he got some sold? Edited by Upstate, 27 October 2004 - 09:38 PM. Yay! One of my favourite threads up and running! Here's one I took on Saturday. As usual came up by accident. 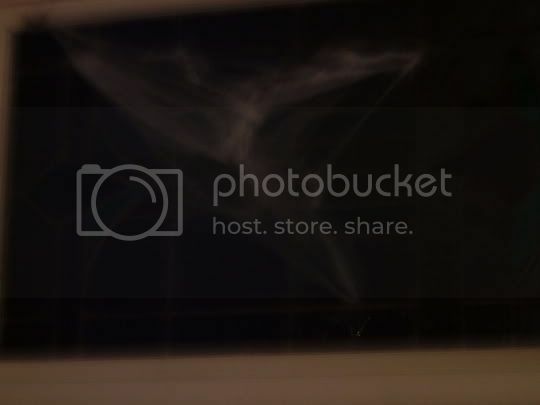 This is a photo, taken at night with a digicam, of a window with fabricated spiderwebs on it (for Hallowe'en) without a flash. Without the flash the web looks like a ghostly ecto mist thing. Even looks like a face in there. I have been dying to have a go at trying the photoshop fabricated, so here are my attempts. Obvious fabrications. 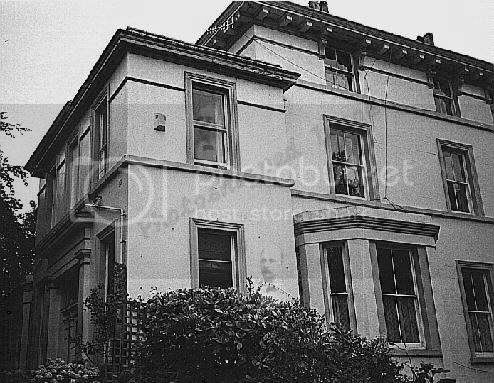 The house is Battlecrease Mansion home of Jack the Ripper suspect James Maybrick. The face I used is that of Maybrick himself to add some credence to the fabricated. 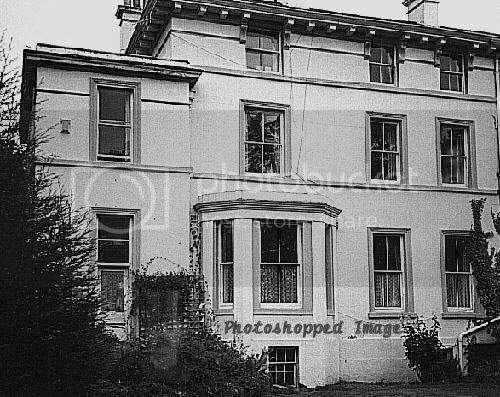 I added the watermark in order to stop it turning up on the net one day as REAL!!!. I have photoshopped 2 poses Of Maybrick in each pic. Same again only different positions for the image. In this one I have superimposed the bride onto the Bride Statue. Placed the same bride in a cemetery. glad of any input as to how believable or unbelivable they may be lol. Edited by smudge, 14 November 2004 - 05:31 PM. My favorite is actually the URL you posted! That one looks more credible. Good job! Here is one I just fabricated, it took 5 minutes to do.. I used ordshall and Lady Jane Grey. I know I have seen one or two similiar to this that are supposedly genuine. I have learned one thing from having a go at faking........Never take any pic at face value lol. These are pretty cool. I tried the throwing flour in the air then taking a picture trick to get orbs, but I got no avail. Wow, Deb! That's another great example of fabrication at its best! Impressive. Great lesson - "never take any pic at face value". Well said! Nice touch, Deb! I'm such a dork!! It took me about five minutes to see the ghost in the second Battlecreek Mansion pic! My favorite fabricated is a video clip from a site called My Son Peter. The whole site/story was made up (I wanna say by an advertising firm?) and they've removed the video from the site since the last time I was there. Does anyone have that clip saved by any chance? If so, can you post a link?? I'd love to see it again! 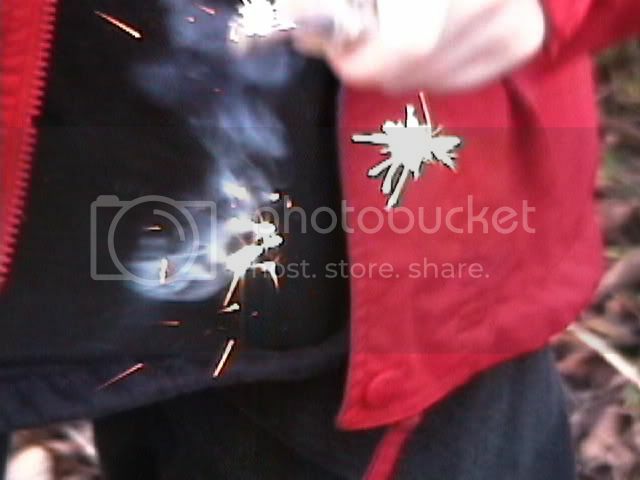 Edited by GhostDog, 21 November 2004 - 06:33 PM. Ooopsy, sorry. I gotta start keeping track a little better. I just realised I didn't come in here to clarify my picture. You're sort of right in the sense that it's a double exposure. This is done on a digital camera however so in order to be able to recreate the results of a double exposure, I set my camera on a tripod and extended my shutter speed to a couple of seconds, giving me enough time to get in to the shot, strike a pose and move out again. It gave some pretty freaky results considering I was in my ghostly Halloween costume and was able to pull it off without motion streaks. 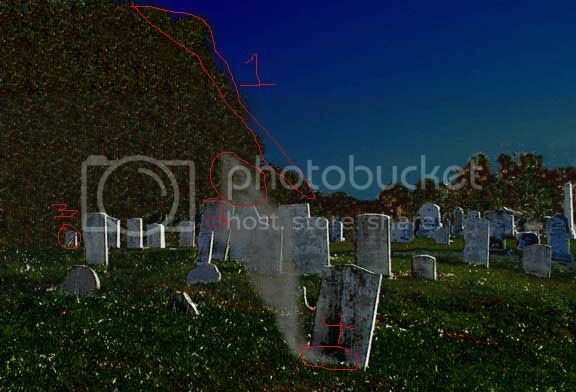 We really need to be careful of this possibility with our photography and supposed ghost photos given to us for perusal. Particularly since the tripod gives the stability. Imagine the results this could give in a cemetary? Neat. I have this great picture that is a perfect example of moisture orbs, put I can't post it. Sorry. Can someone please tell me the reason someone would go through the time and trouble to fabricated a photo? All I can figure is they have no life and nouthing better to do. Also would like to comment that being acused or harsh toward a new ghost hunnter can be very discourageing. Being inexperenced does not mean being a fabricated. I have saw some pretty harsh responses to newbies who are trying to learn. This was made when me and my friend played with some sort of spark thing for our movie. Looks kinda like a fabricated. I'm still not sure how he did this... but here's one that my fiancee took of himself. He has a Lomo camera that just absorbs the natural light, it doesn't use a flash, he's always playing around with it and doing tricks with it. Also, I posted these on the old old board, but why not post them again. Some that were unintentionally fabricated by myself. hey guys, here is a link with some very good fabricated pics that look real, espicially the Nessie pic. Edited by Shadow Gh0st, 07 December 2004 - 10:10 PM. hi everyone, just thought id show you a pic i took recently, there is nothing paranormal in this photo(that i am aware of )i thought that it was an interesting pic of light reflecting in through the backdoor and causing the illusion of something bright and interesting standing on the stairs in doorway i just want to show that simple lighting illusions can easily be mistaken for other things!